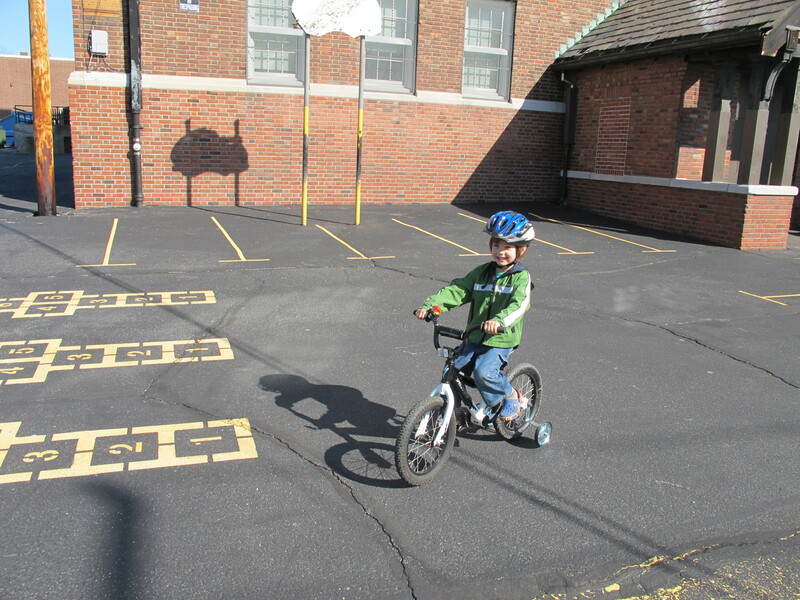 A month ago, I shared a picture of G [finally] riding his new bike, with a promise of a full story later. Bike month seems an appropriate time to make good on that promise. The parent should hold the child by the shoulders and run along behind. It is important that the parent not hold the handlebars-the child cannot learn the feel of balancing if the parent is taking control of the bike. If the parent holds onto the saddle or any other part of the bike, the child will not necessarily realize if they are leaning a bit to one side or the other, because the parent will be correcting for them. Instead, hold the child by the shoulders, so that as they lean to the side, they will feel the side pressure, and can learn to reduce it by turning into the lean. This should be done in a wide flat space, such as an empty parking lot. The parent should not make any attempt to steer the child, just let the bike go where it will. I thought I’d been doing good by holding on to the back of his seat rather than the handlebars, but the above advice made a lot of sense, and I was itching to try it, so after nap time that day, I told Gabriel that I had a new idea for helping him ride his bike. Unfortunately, I had a less-than-willing subject. Once outside, G was more interested in his sandbox than the bike. When I finally coaxed him onto the bike, he lasted all of 1/4 of a block before declaring that he was finished. Sigh! Our next attempt ended in us conceding to training wheels (which I’d REALLY hoped to avoid). I followed the Sheldon Brown advice for proper training wheel use, and adjusted the training wheels to leave some wobble. At first, we left too much wobble [for G’s comfort]. We adjusted the training wheels closer to the ground, leaving just a tiny bit of wobble, but by that point he was pretty much done for the day. 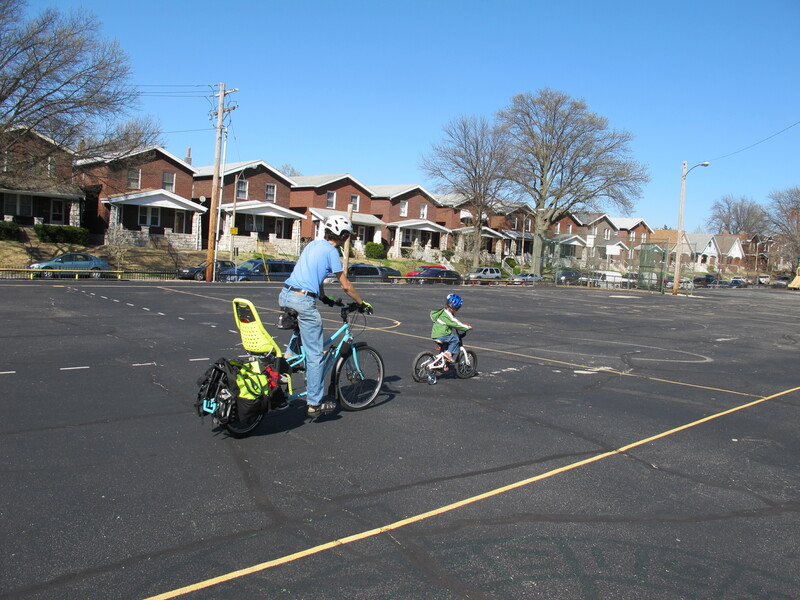 The Saturday of Easter weekend, we towed G’s bike to the local school playground, which features a big open paved space. After some time playing on the equipment, we proposed the idea of a bike ride. No joy. Then Matthew suggested that G’s new bike was feeling lonely because he wasn’t riding it. One of us (don’t remember who) had the idea to ask Gabriel if he wanted to name the bike. He settled on “Lightning” (an imminently practical name, as it has lightning bolts on it), and we started talking about how Lightning wanted to go for a ride. We finally succeeded in engaging Gabriel (and Lightning) in a game of follow-the-leader. For now, [empty] parking lots, or other big, flat, empty paved spaces, are going to be our best riding locations. Sidewalks just have too many distractions, and present too many obstacles — bumps, frequent intersections and alleys, etc. It does mean we’ll have to continue towing G’s bike to said locations — not hard, per se, but we do need to protect Big Blue. I’m pretty sure the towing was what caused this damage to Big Blue’s frame. Between life, allergies, and illness, we haven’t actually gotten Lightning out again (so it’s been over a month — boo!). I did replace the worn-out handlebar grips with a new, bright red pair (G’s color request). I was still debating other “decorating” options — decals, stencils and paint, etc. — and now G is saying he’ll wait to ride in until said decorations are in place. Argh! I’m trying to remind myself that this is a learning process, just like anything else. When in the throws of it, potty learning felt similarly frustrating and never-ending, but it was just a stage that’s now past and that I don’t even think about any more. Eventually, G will be able to ride a bicycle without training wheels — pushing too much now is only frustrating all of us (and perhaps making G more resistant). We’re also in the process of getting a tag-a-long bike (a Burley Piccolo), and I’m hoping riding that will make him more comfortable on his own bike (that is, if he deigns to even get on the Piccolo — at least it’s already a nice color . . . ). This entry was posted in Biking and tagged biking with kids. Bookmark the permalink. The Piccolo is certainly the class act among pedal trailers. 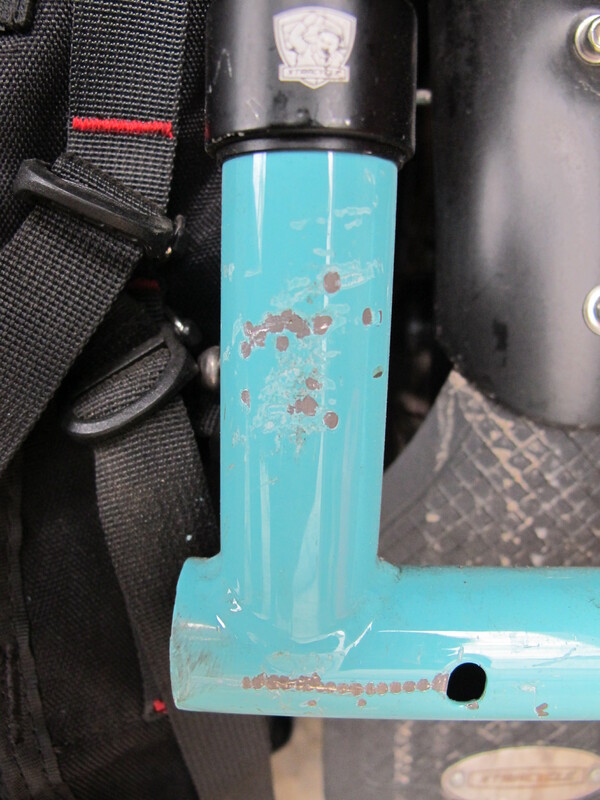 If I were a grandparent, I would have one, rather than any of the “clamp on the seatpost” types. Best of results with this latest of many recent challenges in parenthood. Maybe I’ll get to meet G this summer. Tom, yes, the Piccolo seemed like the way to go. We’ll have one of the racks on each of our bikes. It is actually a gift from my dad (I would say ” from my parents,” but my mom is not fully on board with this idea), who’s been enjoying using the one they just bought with my 4-year-old nephew. I thought I saw something recently about a St. Louis visit — it would be great to meet up! Yes, we are planning for a visit in July. I look forward to meeting you and yours then! Hmmm… well I’m not exactly the best person to offer advice in this area, but if kids are anything like cats they sorta have to think something was their idea before they’re gonna get interested. Maybe you could take him someplace where there are lots of other kids riding bikes? We did have the “other kids on bikes” factor in our favor on that day back in April.